Authorized users can access the Advanced Scheduling tool from a folder and when editing an existing schedule. For more information, see the WebFOCUS Security and Administration manual. Right-click a folder, select New, and then select Schedule, as shown in the following image. The toolbar in the Advanced Scheduling tool provides the same functionality as the Basic Scheduling tool. For more information, see About the Basic Scheduling Tool. 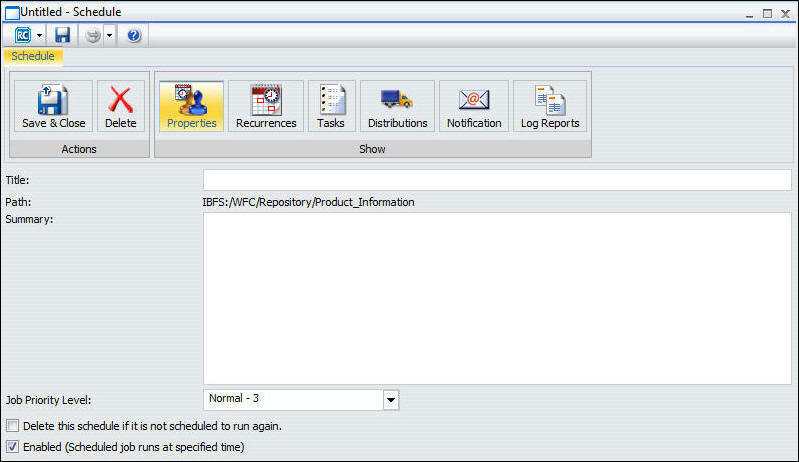 In addition, the Advanced Scheduling tool Recurrences, Tasks, and Distributions ribbon options have a New option within the Manage Recurrences to allow the user to specify when and how often to run the schedule, the tasks the schedule will run to obtain the reports or files to distribute, and where to distribute them. For more information on the New option within the Recurrences, Tasks, and Distributions Manage options, see Advanced Scheduling Ribbon.